Lock in a great price for Crowne Plaza Lyon – Cité Internationale – rated 8.8 by recent guests! Very good room and trained staff. Good facility in the room and very good bed. Packing fee is really good. And it has lots of restaurants and bars nearby. Located in the "Conference area" of Lyon and easy to reach with public transportation (there is a bus stop right in front of the hotel). There are several good restaurants close to the hotel and the bus C5 takes you directly to the Old Town of Lyon. Except for one of the people at the front desk everyone was lovely and helpful with anything that we needed. The breakfast was great and I loved the location next to a beautiful park. Great location for the conference centre and cite internationale, Hotel staff were very pleasant and always happy to help. Always someone on reception and the gentlemen who was there when i asked about going to the city centre was extremely knowledgeable and friendly. Free bottles of water and WiFi are an excellent touch. Beautiful park located straight opposite the hotel. Public transport links to and from the hotel were excellent. good location , calm, good staff, easy access to Taxi and Uber, not far from the center. Really comfy bed, friendly staff, exceptionally clean, secure parking and in a good location for our onward journey. 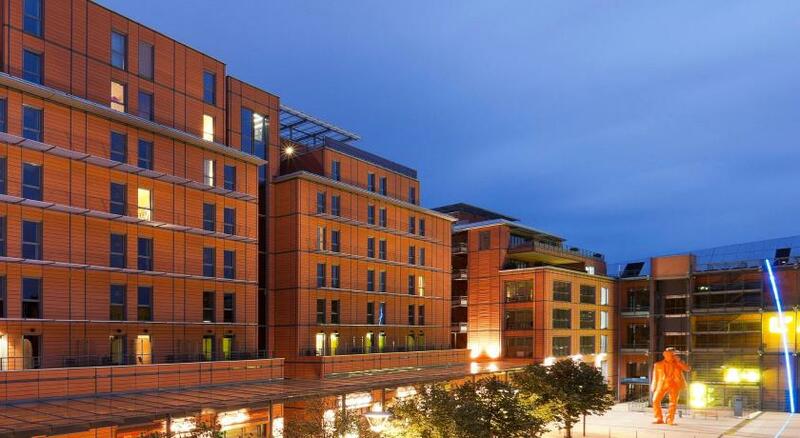 Boasting a 24-hour front desk and a fitness center, the Crowne Plaza Lyon – Cité Internationale has been conceived by architect Renzo Piano, known for his Georges Pompidou center in Paris. It offers free WiFi throughout. The guest rooms feature contemporary decor and offer views of the park and the Rhône River. Guests can enjoy drinks in the the bar, Le Lounge or sample gourmet cuisine at Le Bistrot Rive Gauche - BRG. The hotel is located just next to one of France's largest city parks, Le Tête d’Or, and the Rhône River. It is a 5-minute walk from the Museum of Contemporary Art and a 3-minute walk from the Convention Center. It is also located a few steps from the Amphitheater 3000, which offers numerous shows all year round. This hotel is specialized in organizing seminars and conferences, offering an array of business facilities. The nearest airport is Lyon - Saint Exupery Airport, 16 mi from the property. When would you like to stay at Crowne Plaza Lyon – Cité Internationale? This modern and bright room features large windows with views over the hills of Caluire or the Tete d’Or Park. There is an office area, a safe, a mini-bar, and tea and coffee making facilities. The private bathroom also comes with a bathrobe and free toiletries. Free WiFi is also available. Please note that bed preferences can not be guaranteed and beds will be allocated at the time of check-in. This modern and bright room features large windows with views over the hills of Caluire or the Tete d’Or Park. There is an office area, a safe, a mini-bar, and tea and coffee making facilities. The private bathroom also comes with bathrobes and free toiletries. Free WiFi access is also available. Located on the 1st floor, this room offers a view over Tete d’Or Park with free WiFi access. These rooms have connecting doors for guests traveling as a family. Each hotel suite is located on the second or seventh floor and offers a view over the Tete d’Or Park or the Rhone River, which crosses the city of Lyon. Equipped with a Bose sound system, the large and elegant suites feature a separate lounge area, a separate bedroom suitable for 2 children aged 12 or younger and a comfortable working space. This modern and bright room features views over the hills of Caluire or the Tete d’Or Park. There is a flat-screen TV, a safe, a mini-bar, and tea and coffee making facilities. The private bathroom also comes with bathrobes and free toiletries. Free WiFi is also available. This modern and bright room features large windows with views over the hills of Caluire or the Tete d’Or Park. There is an office area, a safe, a mini-bar, and tea and coffee making facilities. The private bathroom also comes with bathrobes and free toiletries. Free WiFi is also available. This double room has large windows and views of either the hills of Caluire or Tête d’Or Park. There is a working space, a safe, tea and coffee making facilities and a mini-bar. The private bathroom also comes with bathrobes and free toiletries. Free WiFi access is available. These double rooms are located on the top floor and have large windows with views of the Rhone River or Tête d'Or Park. Each includes a working space, a mini-bar, a safe, tea and coffee making facilities and a private bathroom with slippers and bathrobes. Free WiFi is also available. This double room is located on the second floor and has a balcony and large windows with a view of Tete d'Or park. Each includes a working space, a mini-bar, a safe, a Nespresso coffee machine, tea making facilities and a private bathroom with a shower, slippers and bathrobes. Free WiFi is also available. This room consists of two rooms located next to each other. The rooms have air conditioning, soundproofing and bathrobes. The maximum age of children staying in these rooms is 12. House Rules Crowne Plaza Lyon – Cité Internationale takes special requests – add in the next step! Crowne Plaza Lyon – Cité Internationale accepts these cards and reserves the right to temporarily hold an amount prior to arrival. 1. Inadequate pressure of water in basin. 2. Basin plug defective. Water drains away too quickly. Very quiet, clean, comfortable room and bed. The shower is set up in a manner that it is impossible not to flood the bathroom floor when you shower which is wasteful and frustrating. the room was a bite too small, the diner servcie was far to slow. - room service for a dinner terrible quality food: rooted fruit salat and uncooked chicken in the Cesar salat and bottles mayonnaise and ketchup as a dressing!!! The room was too small. Not many kinds of restaurants were around the hotel. The room were small, the hotel was not in the city center but close to the conference centrum. We arrived on a Sunday and all except one restaurants were closed. The breakfast was simple and not to the level of a 5 * hotel. The heating/cooling system was noisy and since our room was facing the street we were able to leave the window open till 5 am only. Bathroom cleanliness wasn't perfect, with a few small rust stains, and the bath tube didn't "seal" 100 per cent. Other than this, your overall good to very good Crowne Plaza. Train station was freaky at night. Location. Rental bikes were right there.